While the noise has stopped at the Carrier Dome, it remains to be seen how long the reverberations last around the Syracuse football program. Friday night, in front of a raucous home crowd, the Orange (4-3, 2-1 ACC) grabbed their biggest win in literally decades by putting away #2 Clemson (6-1, 4-1), 27-24. SU had lost its previous 17 games against opponents ranked in the top ten, dating back to 2002. Clemson alone had beaten them three times in four years as a top ten team. The Orange had not beaten a top-five team since 1991 and they had only one win against a team ranked higher than #4 in 80 seasons before the evening of Friday, the 13th. But, Friday night’s was not a game that SU pulled out in the final seconds. Not only did Syracuse never trail, they led for nearly 34 minutes of game time. The Orange had more rushing yards, more passing yards and more first downs. Clemson entered the night permitting an average of 264.3 yards per game on defense. Syracuse had 270 yards from scrimmage at halftime and finished with 440 overall, including 278 through the air. The Tigers came into the game converting just shy of 49 percent of third downs, but were only able to move the chains on 2-of-11 opportunities against SU. Syracuse ran 83 plays compared to Clemson’s 57 and held the ball for nearly 35 minutes. It was far from a perfect effort, as shown by the Orange allowing six sacks and committing a dozen penalties for 100 yards, but SU was clearly the better team, at least for one night. The signs were there early. 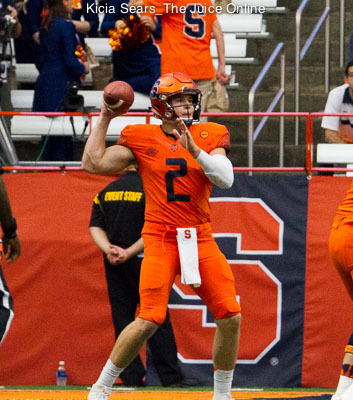 On the first play of the game, Eric Dungey was forced from the pocket and scrambled for 21 yards. That possession ended with Syracuse scoring a touchdown on their first drive of a game since the season opener. On third-and-15 at the Clemson 23, Dungey slipped a screen pass to Dontae Strickland. Strickland was nearly tripped up near the line of scrimmage, but he maintained his balance and took off behind a pair of blockers to the end zone. Cole Murphy booted the extra points for a 7-0 Orange lead just over three minutes into the game. Clemson quickly struck back, needing only 67 seconds to hit for a huge play, getting a 37-yard touchdown run and extra point to tie the game at seven a side. The Orange were forced into a quick three-and-out, but after giving up a pair of quick first downs, their defense stood up. Once backed up inside their 20, the SU defense allowed only two more yards and Clemson’s kicker yanked an ugly line drive left of the uprights on a 35-yard field goal try, leaving the game tied. The Syracuse offense quickly took advantage. On the second play of their ensuing possession, Erv Philips ran through a busted coverage and behind the Clemson defense. Dungey hit him in stride at the Tigers’ 45 and Philips coasted into the end zone for a 66-yard touchdown. Murphy added another extra point, this one for a 14-7 Orange lead with just over five minutes left in the first. 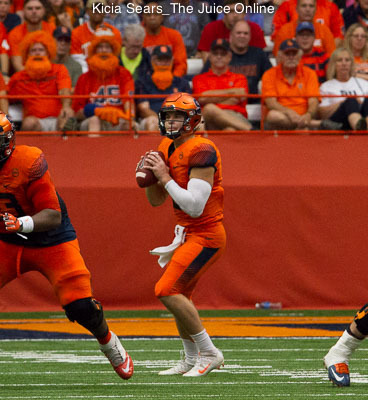 On their first drive of the second quarter, the SU offense appeared poised to extend the lead. Syracuse had five consecutive plays of double-digit gains, including a couple via Clemson penalties, to move from their own six into field goal range. Then things went poorly, as the Orange committed a false start and gave up a sack. Backed up to the 30, Dungey hit Steve Ishmael down the right sideline and he fought through a tackler to stretch into the end zone for a touchdown, but Ishmael was called for pass interference. On third-and-31, Strickland took a handoff and was fighting for extra yards when he was stripped of the ball. 63 yards of fumble return later, the Tigers had a tying touchdown just before the midpoint of the second quarter. SU responded, converting both a third and a fourth down on the next drive to get to the Clemson 35. Dungey connected with Ravian Pierce to get inside the Clemson ten. After a second down sneak from the one, Dungey was slow to get up and forced from the game for a play. Zach Mahoney was dropped in the backfield on the next play and the Orange settled for a 21-yard field goal from Murphy for a 17-14 lead with just under four minutes left in the opening half. That score held to the second Clemson drive of the third quarter, when the Tigers cashed in a 30-yard field goal to erase the Syracuse lead and tie the score at 17. The Orange then became a quick strike offense once more. On the second play of their following drive, Dungey took off and raced for 45 yards. Two plays later, he dropped a perfect strike into Ishmael’s arms for a 30-yard touchdown. Murphy booted the extra point through the uprights for a 24-17 lead with just over seven minutes left in the third. It took the Tigers three plays to tie the score, getting a 52-yard touchdown run and the extra point for a 24-24 game. They could have taken their first lead of the night on their next possession, but their kicker missed once more, this time on a 38-yard field goal in the final minute of the third. SU took advantage, grinding out 68 yards in 16 plays, including a fourth-and-one conversion when Strickland picked up three yards to get inside the Clemson 20. The drive stalled at the Tiger 11, but Murphy hit a 30-yard field goal for a 27-24 Syracuse lead with 9:41 on the clock. After picking up a pair of first downs, the Clemson offense stalled. Facing a fourth-and-six at the Orange 41, the Tigers opted for a fake punt. The pass, which looked designed more to draw an interference penalty than to actually be completed, fell harmlessly to the turf, giving SU the ball with 6:10 on the clock. The Syracuse offense went on a clock-killing mission from there. Three handoffs to Strickland netted 11 yards and a first down. 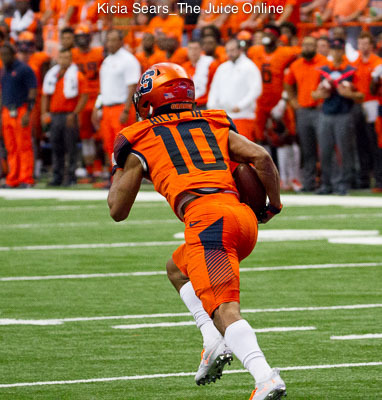 Following a sack, Dungey completed a third-and-11 comeback route to Ishmael for 13 yards to move the chains again. On the following set of downs, a delay of game flag switched a third-and-three to third-and-eight. On a quarterback draw, Dungey was dropped to the ground, but not before he stretched the ball forward, picking up just enough ground for a first down with 1:37 to go. All the Orange had to do was down the ball three times to burn the remaining time. And they did, bringing fans pouring out of the stands for an onfield celebration with the team. While not his greatest statistical effort, it might have been Eric Dungey’s best performance at Syracuse. The junior quarterback completed 20-of-32 passes for 278 yards and three touchdowns while picking up 61 yards on 21 carries. Dontae Strickland converted 19 carries into 78 yards while Erv Philips had four catches for a game-high 94 yards and a score and Steve Ishmael led SU receivers with six grabs for 73 yards and a touchdown. The Syracuse defense had four sacks in the game, as Parris Bennett, Zaire Franklin, Aldon Robinson, and Chris Slayton all had one. Slayton’s may have been the biggest, as it knocked Clemson’s starting quarterback from the game just before halftime. Bennett was the leading tackler for the Orange for the fourth straight game, as he was credited with nine stops. SU returns to action on Saturday, October 21 when they travel to #11 Miami. The Hurricanes (4-0, 2-0) have a Saturday afternoon matchup with Georgia Tech prior to their visit from the Orange next week. Kickoff for the Syracuse-Miami game is slated for 3:30pm Eastern on the 21st and an announcement will be made Sunday regarding which television network among ABC, ESPN, and ESPN2 will broadcast the game. Regardless of network, the game can also be streamed online through ESPN3.